In his former role at the White House, Olson was the assistant director for Space and Aeronautics in the Office of Science and Technology Policy where he was responsible for interagency civil, commercial, and national security space and aeronautics policy. In his new position, he will be responsible for space exploration and advanced development of the Dream Chaser program, including international, interagency, and industry relationships, as well as government affairs. Olson joins SNC with over 25 years of government service and extensive technical, programmatic, and operational aerospace experience in the United States Air Force, the National Aeronautics and Space Administration (NASA) and the White House. Prior to serving at the White House, he was a senior executive at NASA where he was the director of two divisions in the Human Exploration and Operations (HEO) Mission Directorate at NASA Headquarters (HQ). Olson was responsible for NASA’s integrated human space exploration architecture, operations concepts, mission plans, and analysis of technology, capabilities, and systems, as well as, risk and knowledge management, communications, public outreach, and education. Olson also managed international, interagency, industry, and science partnership coordination. In other NASA assignments, Olson was director of the Exploration Systems Mission Directorate Integration Office, where he oversaw the integration of NASA’s human and robotic space exploration activities. As the former exploration transition manager at NASA HQ, he was responsible for exploration planning activities and processes to support the retirement of the Space Shuttle Program and transition to the Constellation Program. He started his NASA career as the manager of International Space Station (ISS) Operations in the Office of Safety and Mission Assurance. Before joining NASA in June 2004, Olson held numerous leadership positions in the U.S. Air Force as the chief of the Space Test, Operations, and Programs Division at Kirtland Air Force Base, N.M.; chief of Test, flight commander of Special Projects, and Airborne Test Branch chief at the Air Armament Center at Eglin Air Force Base, Fla; Special Operations flight test program manager at Hurlburt Field, Fla.; and at the Air Force Advanced Composites Program Office at McClellan AFB, Calif. Olson continues to serve as the director of the Joint Reserve in the Office of the Assistant Secretary of Defense for Research and Engineering at the Pentagon. 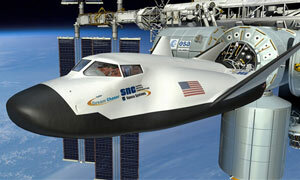 SNC is one of three companies funded by NASA’s Commercial Crew Program to develop the Dream Chaser® Space System. The Dream Chaser Space System is on the forefront of the commercial human spaceflight industry, offering safe, reliable, and cost effective crew and critical cargo transportation to low Earth orbit. Sierra Nevada Corporation’s Space Systems business area has more than 25 years of space heritage in space and has participated in over 400 successful space missions through the delivery of over 4,000 systems, subsystems and components. During its history, SNC’s Space Systems has concluded over 70 programs for NASA and over 50 other clients. For more information about SNC’s Space Systems visit www.sncspace.com and follow us on Facebook at Sierra Nevada Corporation Space Systems.